Have you noticed that for a while, in internet-land, fashion blog post titles which read something like “Six Blogger Approved Ways to Wear Culottes” or “Blogger Approved Denim” were ubiquitous? Well, trust me, they were. Please note the use of the past tense here, and I’ll explain a bit later. For now, let’s focus on this pair of cropped pants which I bought at Nordstrom a week or so ago. Unfortunately they weren’t part of the Anniversary Sale… but they were on my list for fall. And I love them. So they came home with me. Yep. 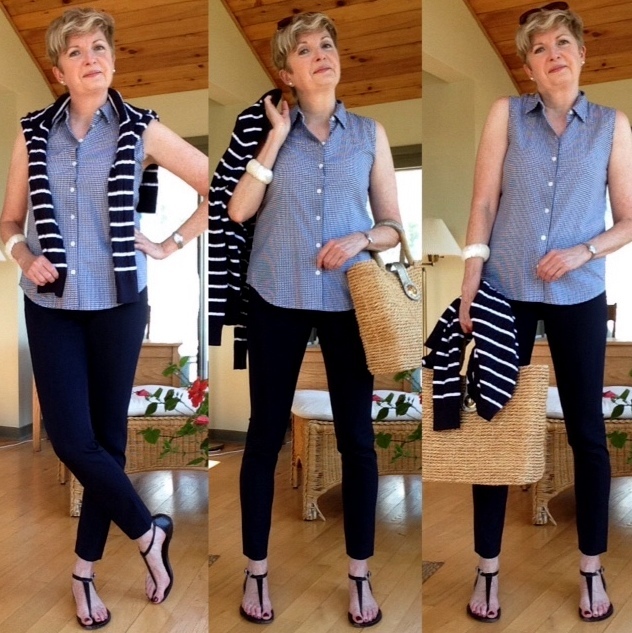 These Veronica Beard navy, cropped “scuba” pants are definitely “blogger approved.” At least by this blogger. Over the hill, and well past my sell-by date though I may be, I still love (dare I say obsess over) a great pair of cropped pants. I love the look of a polished cropped pant. They suit my body-type and my style preferences. And these pants in particular are stretchy and really comfortable, with edgy seaming down the back. And being navy they go with everything in my minimal closet. All of my tops, and most of my shoes and sandals. 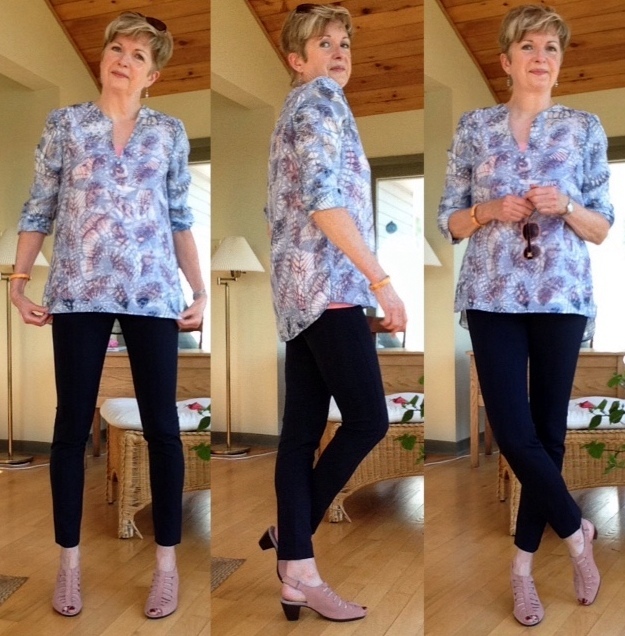 I tried them with an Equipment silk shirt, a coral cami and my Munro sandals. This look is more office casual, than ladies who lunch. But, when the weather finally cools, a denim jacket or my khaki suede Twiggy biker jacket would toughen this outfit up a bit. 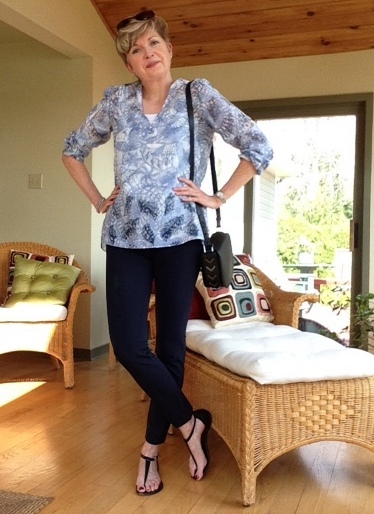 Then I swapped the Equipment shirt for my Tory Burch tunic from last year. I like this look better. I’m kind partial to the coral cami under the blue and white tunic. But the look below is more likely what I would reach for if I were just popping into town to return my library books or to buy a bottle of wine for dinner. I swapped out the coral cami for a white one and traded the Munro sandals for my flat Michael Kors. 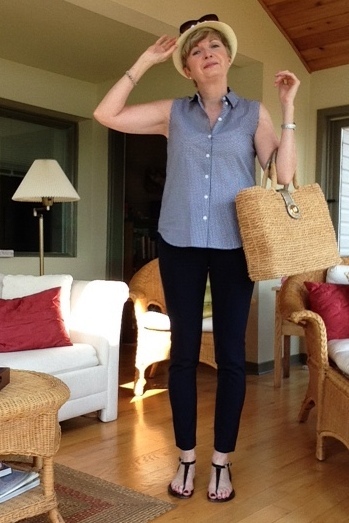 If I were heading out for some shopping on a very hot day…. hitting the sales for sheets and towels and other exciting household stuff… in which case I would be in and out of the air conditioned car and in and out of air conditioned buildings… I’d need to be cool when outside… hence bare arms…. and able to cover up a bit when inside buildings where the AC is on overdrive… hence the light sweater. And I’d need to carry a bag big enough to hold my glasses, my list, and the book I’m currently reading. Since one of the newly discovered (since retirement) joys of shopping by myself…. is stopping for coffee and a treat and reading my book while I indulge. Sigh. What’s the hurry, eh? So last week on just such a very hot day, I wore my new Veronica Beard pants, with my sleeveless Equipment gingham shirt, and my flat MK sandals. And tossed this Brooks Brothers sweater around my shoulders in case of AC chill. I could always stuff the sweater in my old straw MK bag with my book if necessary. And if I were going to be out in the sun too much. And if the coiffure… the OMG I can’t wait for my hair appointment coming up in a few days swirl of curly fringe… became too much to handle… well… I could always take your advice and throw on a hat. Or not. I must say, as much as I love my vintage hats, I’m not much of a hat person generally. So that’s what I’m doing with one of my purchases from my day at the Nordstrom Anniversary Sale… when I bought stuff that wasn’t on sale. Ha. Just my luck, eh? But, I’m seriously in love with these pants. They are light enough to wear now, and I will get a ton of wear out of them this fall. With a white tee and my sneakers. Or my loafers and the matching Veronica Beard jacket that I also bought. Maybe even under my navy Rag and Bone dress. I’m kind of thinking of trying the dress over pants trend. And cropped pants are always on trend, aren’t they? So very Jackie O. on holiday in Capri. Not that I look anything like Jackie O. in mine. Yep, these pants are definitely “blogger approved.” I had a chuckle when I thought of that title earlier in the week. So very au courant in blogger-land. Ha. At least it was last week. But this morning when I scrolled through my Bloglovin’ feed… I couldn’t find one blog which used that phrase. Not one. So I clicked on the two blogs which I know use it… or used to use it. Nope. Not there either. Seems that particular ubiquitous line has run its course. Yesterday’s cute phrase. Here there and everywhere one week, long gone the next. And I have missed the boat with my tongue-in-cheek title. That must make me… well… a bit behind the times. Maybe even old… do you think? Nah. I’m not buying that. I know that none of these outfits are necessarily fashion-forward. Or particularly edgy. But they are casual, comfortable, and polished enough for my purposes. Which given that our looong stretch of humid hot weather is making me very cranky, is good enough. I may not be sweating about the fashion police this week. But old? Nope. I’m not ready to slip into my baggy pants and pastels just yet folks. Any items in your closet that are “blogger approved” or “blog reader approved?” We’re dying to know. PrevPrevious storyWhy the Internet Makes Me Crazy. I love a pair of cropped pants, and these look fabulous on you. Think they'll dress up nicely too. Yes, I've seen a few of those "blogger approved" titles, too funny! Thanks, Sue. Yes, I think they will dress up nicely. So much potential with these pants. Oh yes…there will be food, but that's Hubby's department. I was strictly on wine duty. Win, win. I received the list. Thanks sooo much Patti. My friend and I decided we should check out the vintage shopping in New York, having heard so much about it. And I knew you would know where to go. Thanks, Jenn. The slim pant is definitely what I'm most comfortable in. I now know when you say pants we are not going to see a pic of you in your underwear . I still seem to have to call them trousers though – it's ingrained . Anyway I really like them & look forward to seeing the jacket too . Ha. That made me chuckle Iris. You are sharp! I'm excited to start wearing the jacket… but I'm making myself wait. Partly because of the weather. Partly because it will be so much sweeter after a wait. Deferred pleasure. I love cropped pants and all your outfits are something I like and would (or am,similar pieces) like to wear. They suits you great. I was on vacay :-)/vacation,bad internet,lots of mysteriously lost comments,so,just one sentence about an old post: your hair is gorgeous! Thanks, Dottoressa. I know the outfits in this post are not earth shatteringly edgy. But like the young blogger over at The Stunning Look said (I quoted her a few months ago) "practice what you post." I like that sentiment. I love that photo of Jackie on your post. Her look is so chic and so transferable to today. Love those pants and must look for them. Have not heard of the brand. But now that they are "Blogger approved." I will venture out into the unknown ( better knonw as Nordstoms) and check them out. Particualarly like them with the MK sandals. Thanks, Sandra. This was the first I had heard of this brand. Started in 2010 in California (I think)…that's down your way, isn't it? All these outfits are wonderful on you — your look is always fresh while classic with a beautifully low-key way of incorporating new trends so that you own them rather than vice versa. I'm sure that if you went back to visit your old school, some of the older girls would be wondering where you shopped, admiring the look — not in the sense of thinking you dressed as young as they do, but rather as a look they might aspire to before long. Curious to know how/whether you would wear those cropped pants once the temperatures drop to boot-wearing weather. Will they stay in the closet then until spring thaw or do you have plans for keeping them in rotation through the winter? Thanks Frances. I remember a female student one year confided to me that her boyfriend (who was also in my class) thought I dressed "nice"…to her there was no higher praise. So cute. As for the cropped pants, I may not get that much wear from them when the snow flies. But they will certainly be in heavy rotation all fall… with my sneakers and loafers etc. Hope you are enjoying your "break." Thanks, Anna. Don't worry. That line isn't "in" anymore. What I saw replacing it was "Six Way That Fashion Girls…" Sigh. Those pants are definitely approved by this blogger! As a long-legged gal who spent most of my life looking for pants that were long enough, crop pants seemed counter intuitive, but now I've grown to love them. Thanks, Elaine. At first cropped pants made me remember all those times as a kid when my slacks or jeans were too short on my long legs. Now I love them. Really great choice of pants/trousers Sue! I actually bought a pair of smart cropped trousers just before we set off for Canada. Packed them but didn't actually wear them …it was just too hot! Definitely hoping to wear them with boots though, through Autumn and maybe even an evening out in the Winter …if we take the car! Looking forward to seeing how you wear yours …and the jacket. I think they'll look good with your suede biker jacket too. Hope you're having a good week …I'm struggling with jet lag and mountains of washing!! 🙂 at least the suns shining and it's a pleasant 23 deg. Too funny! I've seen those titles before too. Love your pants, you styled them fabulously. They are great. I have a hard time finding pants that fit me. A very versatile pair of pants and yes you are not over the hill yet I agree. My favourite look is with the blue tunic, both ways, but they are all super. Thanks, Anna. I love that Tory Burch tunic. It looks better in person than in pictures. Hmmm. I'm pretty sure I paid $295.00 Canadian. As I said above, when I find a pair of pants that actually fit me I just go for it. Knowing that I will have them for years. And that they go with almost everything in my closet. From your comment I guess that's more than you're willing to pay. Ah well… each to their own.